Jones stole points in two early ends and scored three in the seventh to drop Anna Hasselborg of Sweden, the gold medallists from Pyeongchang, South Korea, 8-4 in eight ends. 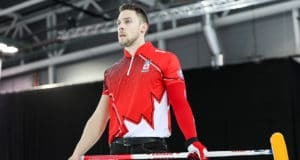 Earlier in the day Jones, backed by third Kaitlyn Lawes, second Jill Officer, lead Dawn McEwen, alternate Shannon Birchard and coaches Wendy Morgan and Elaine Dagg-Jackson, beat the silver medallists, EunJung Kim of South Korea, by the same 8-4 score. The results left Canada at 8-0, Sweden 8-1 and South Korea at 6-2. Victoria Moiseeva of Russia beat Daniela Jentsch of Germany 6-2 to move into a third-place tie with South Korea. Canada scored singles in the first, second and fourth ends before stealing two in the fifth to take control of the game at the Memorial Gardens. And how they ended, obviously. Hasselborg, with third Sara McManus, second Agnes Knochenhauer, lead Sofia Mabergs, alternate Jennie Wåhlin and coaches Maria Prytz and Peja Lindholm, struggled with the ice throughout the game and never did find their draw weight. And while it is only one loss and they’re in no real danger of missing the playoffs, Hasselborg wasn’t pleased. In the other evening games, Tori Koana of Japan (4-4) took an 8-6 win over Diana Gaspari of Italy (2-7) and Hannah Fleming of Scotland (3-6) scored an 8-7 win over Yilun Jiang of China (3-6). South Korea (6-2), Anna Kubešková of the Czech Republic (4-4), Jamie Sinclair of the U.S. (4-4), Switzerland’s Binia Feltscher (3-6) and Angelina Jensen of Denmark (2-6) had the evening byes. The 2018 Ford World Women’s Curling Championship continues Thursday with the draws at 9 a.m., 2 p.m. and 7 p.m. (all times ET). 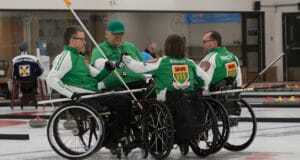 Next: EVEREST CANADIAN SENIORS GET UNDERWAY SATURDAY AT STRATFORD, Ont.